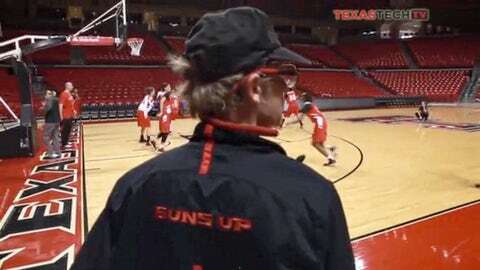 Thousands of Texas Tech fans cheer on their basketball team at the United Spirit Arena, but nobody is happier to be there every day than one man. Jim Anderson has made sure the first-class facility is ready for showtime the past 12 years as the first person to arrive and the last to leave. Anderson’s work is indoors at one of the premier arenas in college athletics, but his home has been outdoors and can barely keep him warm. TexasTechTV shares the story of his struggles and how his Red Raider family are giving him a gift he truly deserves. Anderson was forced to live in a small tent after an oil lantern caused a fire that engulfed his house five years ago. But that didn’t change his outlook on life as he continued to be an inspiration to many at Texas Tech. "He always encourages you after games after a tough loss or even with a win," Tech men’s basketball forward Jaye Crockett told TexasTechTV. "He has the same attitude all the time. Jim’s family around here." Although Anderson doesn’t have any children of his own, he has been a role model to many student athletes through the years. "I raise kids for two to four years and then throw them out of the house," he said. Anderson has never been one to ask for charity, but those who knew about his living situation wanted to help. Marshall Thornhill, an employee of the Texas Tech athletic department, provided him with some clothes, anonymously. Thornhill still felt he could to do more, so he reached out to a non-profit organization with some bigger ideas. "I want to build this man a house," he said. West Texas weather can be harsh. Snow during the winter, sweltering hot in the summer, and windy on the South Plains year-round. "Last winter was brutal, and to think that man going home to a tent in this kind of weather," Thornhill said. "I’ve seen him come to work dripping wet in the mornings and it’s cold." Anderson’s new house will break ground this spring, but Thornhill helped him moved out of the tent in the meantime. "I decided I was going to challenge people that knew him and come up with the money to get him an apartment," he said. Not only did they set him up in an apartment this holiday season, but it was fully furnished. "If I teach these kids honesty and integrity, then I think that’s the best goal I could have accomplished in life," Anderson said. Check out TexasTech.tv for more information and updates on Anderson’s new home. Follow Louis Ojeda Jr. on Twitter @LouisOjedaJr.